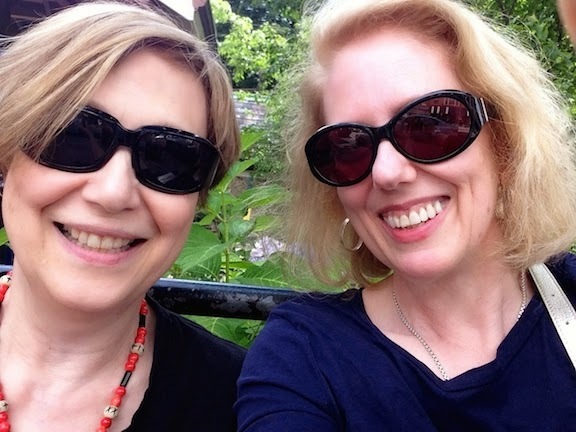 Last week I attended the conference connected with the "Threads of Feeling" exhibition now on display in Colonial Williamsburg. The exhibition was originally shown at the London Foundling Museum, and the conference's keynote speaker was John Styles, the show's curator. 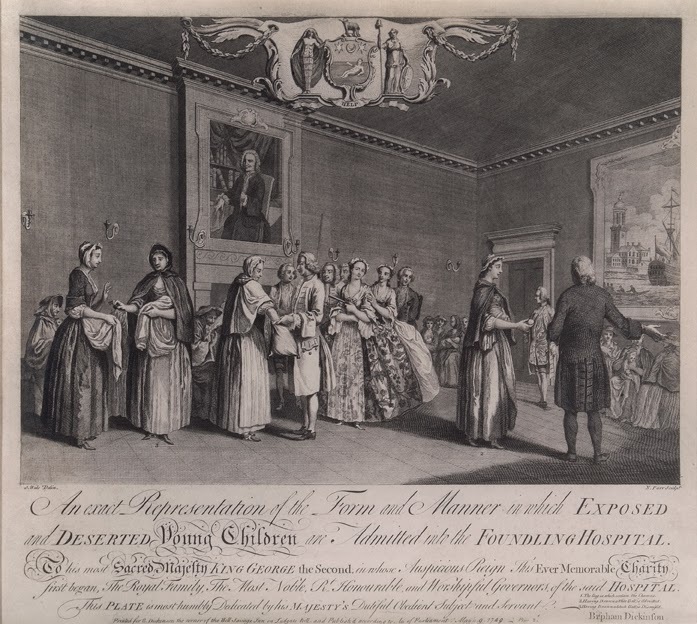 Through the records of the children left at the Foundling Hospital in the 18th c., this poignant exhibition shows the plight of the mothers - and occasionally the fathers - and the children for whom the Hospital offered one last chance at hope and survival. Not all the foundlings were the children of single mothers; nearly a third came from parents who were wed, but too poor to raise the child. I've written about the Hospital and the textile tokens that are the major feature of the show here, and also linked to the slideshow made for the Museum here. The exhibition is small, with two rooms of cases displaying the open billet books with the tokens. Only one page and token from each book can be displayed at a time, but the size of these thick books still manages to represent the sheer number of foundlings taken into the Hospital. The first time I visited the exhibition, the galleries were crowded with visitors discussing what they were seeing, and along with the others I admired the scraps of textiles and read the sad little notes that were attached. The second time I went at the end of the day, when I was the only visitor in the galleries. Yet I wasn't alone: I heard the desperation of those long-ago mothers in every scrap of fabric, their voices clear in the handful of words that they left with their children. There were heartfelt pleas to look after special babies, notes of names that had been carefully chosen, and pledges to return one day to reclaim the children when their own circumstances improved. The statistics accompanying the show told the grim truth. Between 1741 and 1760, 16,282 babies were admitted to the hospital. Nearly 11,000 of them, or roughly two-thirds, died. Only 152 were reclaimed by their mothers. Still, that also meant that a third did survive to adolescence, and were launched on useful lives to learn various trades as apprentices. In fairness, too, the staggering rate of infant mortality didn't reflect abuse or deprivation in the Hospital. According to Professor Styles, the figures were much the same for the rest of mid-18th c. London. The print, above, represents the Hospital's admission lottery, c. 1749. Run as a private charity, the Hospital's limited funds in its early years meant that only a fraction of the thousands of infants brought to the gates could be accepted, with only 200 children admitted annually. The lottery was devised to bring some measure of fairness to the admission process. As shown in the print, mothers reached into a bag and drew out a colored ball. White meant the infant was accepted, pending a health review. A black ball - which the majority received - meant rejection. Observing the proceedings are a group of well-dressed ladies and gentlemen, whose presence must have made everything even more difficult for the poor mothers. One of the lucky ones must have been the mother of little Florella Burney, who was admitted to the hospital on the day of her birth, June 19, 1758. Her token was a scrap of floral cloth, below, and the accompanying note begs that "particular care be take'n off this child, As it will be called for Again." Florella was baptized and given the more sensible name of Mary Dench (renaming was the Hospital's policy), and when she was eleven, she was apprenticed to a milliner: a success story. Her mother, alas, never returned. "Threads of Feeling" continues at Colonial Williamsburg (the only American location for the show) through May 26, 2014; more information, plus a podcast with the exhibition's curator John Styles, here. The exhibition's catalogue includes many photographs, and is available here and here. Top: An exact Representation of the Form and Manner in which Exposed and Deserted young Children are Admitted into the Foundling Hospital, 1749, etching by Nathaniel Parr after a painting by Samuel Wale. The Foundling Museum. 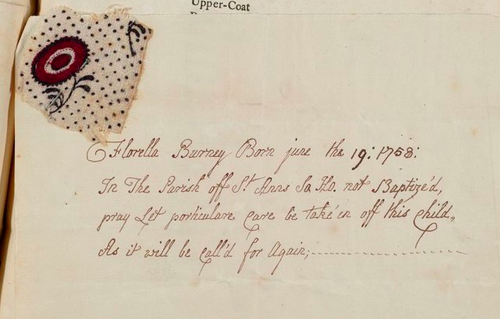 Below: Florella Burney, Foundling number 8959, textile token. The Foundling Museum. The collection book and additional books about the tokens is also available from www.burnleyandtrowbridge.com. How sad it must have been for these poor mothers who had no option but to give up their children. One can only shudder at the thought of what happened to those whose infants were not accepted! Interesting article! The mortality rate figures have always made me wonder why modern literature - historical romance specifically - never dwells on how many infants were lost to illnes. I know that romance stories are suppose to focus on feel good situations and endings but it makes you wonder about the state of mental health for the adults that lost multiple children. The mourning periods and the cult of the celebration of death (reflected in many grave markers) is an interesting subject that I think most people don't know about and could make for interesting subplots in the typical 17th-18th century historical fiction. At lot of information on the cult of death is in a fasinating book called "The Hour of Our Death" by Philllipe Aries. I'm late as usual, but I wondered; how did the mothers who reclaimed their children know for sure that it was their child? Especially in the face of renaming the children and not all of them having a piece of fabric or something left with them when they were accepted?